Sugar Hill Manor Guesthouse - Eshowe Accommodation. The moment you arrive at the Sugar Hill Manor Guesthouse in Eshowe you will feel welcome and at home. 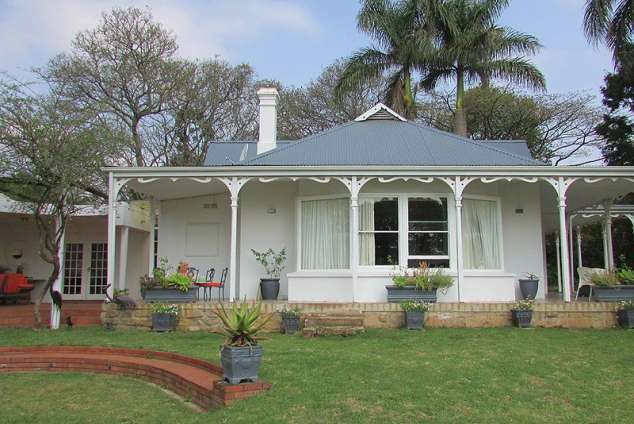 Set in a large, 100-year-old Victorian home with magnificent country views, the property provides a comfortable and friendly country Guesthouse with colonial family atmosphere in a spacious garden. Sugar Hill Manor has become an ideal stopover for local and overseas travellers and businessmen. The family home has been elegantly converted to provide seven light and airy bedrooms. Here the gentle morning sun will caress you from your bed and the sounds and smells of sizzling bacon will draw you to the mahogany breakfast table. You may well spend your time at the guest house reading on the black-and-white tiled stoep looking out over the hills. A large verandah with stunning views over sugar cane plantations. Dining Room / Lounge for you to relax in. Lunch & Dinners can be booked. Room 1. Double Kingsize and two singles en suite. A very large room. Room 2. Double or twins. Room 4 4(a) & 4(b). These two rooms which are one unit share a communal lounge / TV area. Regarded as a single unit. Room 4(a) Double, Room 4(b) Twins or Double. Double Queen en suite. Another bed can be added to this large room. Cottage. Small lounge single unit en suite. Room (1) Double or twins. Complimentary tea, coffee, fruit, biscuits and sweets. Tips on all the best of the local attractions and events in Eshowe. The Guesthouse is solely for the use of our guests, offering exclusivity and privacy. Owner resides on premises but separately, ensuring safety and round the clock assistance. We welcome children - please specify their age when enquiring. Camp cot can be supplied for babies. Price includes a full English breakfast, bottomless cups of filter coffee and a selection of teas are served and early breakfast can be arranged. 1417 page views since 22 Nov, 2016. Last updated on 10 Dec, 2018.